There are times, occasionally, when someone needs to borrow money. We’ve discussed Promissory Notes before. 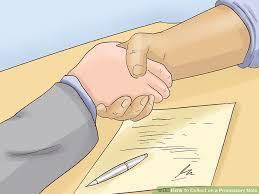 Promissory Notes legalize and bind two parties when there is a loan involved. Generally speaking, notes are easy to understand documents that explain the facts about the loan itself. With that being said, an important part of a loan process is knowing the answer to this question: “When Do I Need an Installment Note”. To keep it simple, by definition, an installment note is a Promissory Note. An installment note calls for payment of both principal and interest in specified amounts, or specified minimum amounts, at specific time intervals. This periodic reduction of principal amortizes the loan. Interest due is kept current under the payment plan and the principal is reduced by some portion after each payment. Over the term of the payment schedule the interest paid will become less while the principal paid back becomes more. Both the lender and the borrower agree upon the payment of the Promissory Note, the terms of the payments and the interest rate to be charged. All terms and obligations are clearly spelled out. The payment structure of a traditional note is consistent over a specified period of time. The beauty of the note is that consistency — for both the borrower and the lender. If for whatever reason, the borrower defaults on the loan, the most common terms found in a note will provide that the lender may elect to accelerate the entire amount due and demand payment in full at that time or the lender can elect to have the accrued interest added to the total principal amount owed on the note at the time of the default. Unfortunately, loans from banks, mortgage companies and auto lenders over the years have made loans seem like a complicated process that the average layman can’t decipher. These types of lenders, however, hold security for the loan being made so if there is a default in payment, they can recover the loan amount by collecting or foreclosing on the security (such as an auto or real property). These types of loans entail much more paperwork and terms. With an unsecured Installment Note, the loan is far less complicated and simply spelled out. If you have a loan situation where you would prefer to keep things simple and you do not require security for a loan, then the Installment Note can be a great choice. In any circumstance where a loan is made between family or friends, documenting that loan in a written form creates an understanding that can eliminate future problems. As the lender, you can construct an Installment Note in the Legal Form Library, naming the parties, where payment will be made, the interest to be charged, the period of time the loan will run, monthly date when payment will be due, and the payment amount. Visit our interactive downloadable forms for more information.